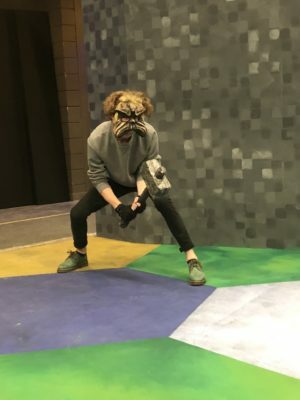 The TRU Actors Workshop Theatre’s production of She Kills Monsters is a fantastic and surreal play that puts the “role” in “role-playing game”. To start, the setting albeit simplistic, is beautiful and painted to look reminiscent of old dungeons and dragons maps, making the audience feel immersed in the environments that the characters explore. The overall story is about a girl named Agnes who discovers a D&D game her sister made after she died. Throughout Agnes’ adventure, she learns things about her sister that she hadn’t known when she was alive, learning about her struggles with school due to bullies that made fun of her to her disliking Agnes’ boyfriend. As the story progresses, we learn that Agnes is denying that her sister is gone and believes that she is really communicating with her through the game, only to learn that her personality is being manipulated by the dungeon master. By the end, Agnes learns how playing D&D allowed her sister and her friends to feel free to express themselves by playing the game, to be able to do things that they wouldn’t be able to do otherwise. With a story like this, the characters have to be well written. In this production, the characters were not only well written, but incredibly executed. Every single character is invested in their roles and did a fantastic job with connecting to the characters they were playing. Agnes is a level-headed and determined woman who has to go on a journey through the five stages of grief. Chuck is an eccentric nerdy DM who is a master with his words, able to turn anything anyone says into an innuendo. Agnes’ sister, Tilly, may seem a little flat, but that’s the entire point. She’s not Tilly, she’s a character that Tilly would play. That being said, everyone onstage gave a hundred and ten per cent to every second to their performances. Also, in terms of the costuming, they portray the original monsters so well that they are scarily realistic. From a simple elf costume, to a leather armour set, to life-sized dragon heads, to a massive beholder, every single costume and puppet was enough to rival the works of Julie Taymor (The Lion King)! With such amazing yet deadly monsters, the characters display realistic and epic fight choreography. The swordsmanship and hand-to-hand combat was well executed and had absolutely no flaws. She Kills Monsters is a fantastic immersion into the world of role-playing tabletop games. With an exceptional cast, gripping story and powerful visual storytelling, this play is simply… a critical hit!